supply elasticities with respect to transfers are in line with microeconomic estimates both in aggregate and across subpopulations. In this model, counterfactual experiments indeed show that generous transfers in recessions discourage spousal labor supply significantly after the head's job displacement. Given the large incentive costs of transfers, I solve for optimal means-tested transfers paid to poor families and employment-tested transfers paid to the unemployed. Unlike the current policy that maintains generous transfers of both types in recessions, I find that the optimal policy features procyclical means-tested and countercyclical employment-tested transfers. 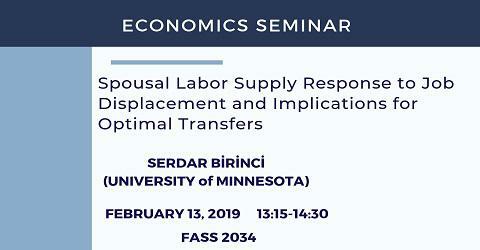 In an alternative environment where spousal labor supply were invariant to transfer generosity, the optimal policy would instead be countercyclical for both transfers since the crowding-out effects on spousal labor supply would be unaccounted for.